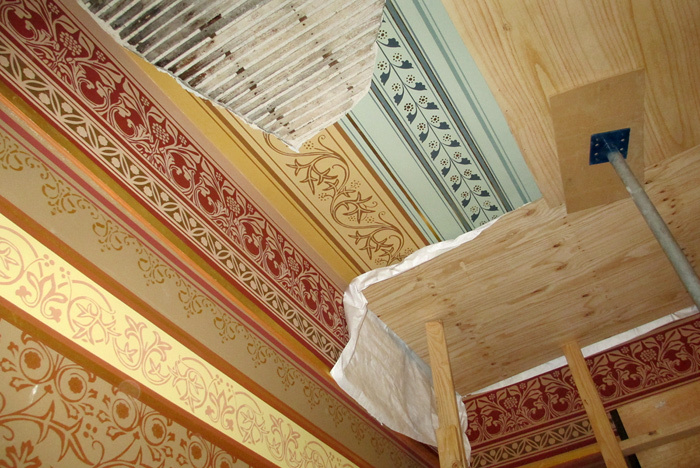 Following recent partial collapse of a decorated ceiling at the Gothic Bank in central Melbourne, Lovell Chen’s conservation team has overseen detailed restoration work. 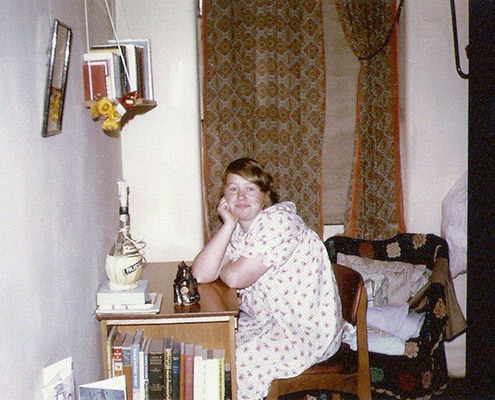 We have a long association with the complex, completing its full restoration in 1990. The ceiling that collapsed is on the second floor of the Verdon Chamber stairwell in the 1887 bank building designed by William Wardell (1824-1899), one of three buildings amalgamated by the ANZ Bank in the 1920s. 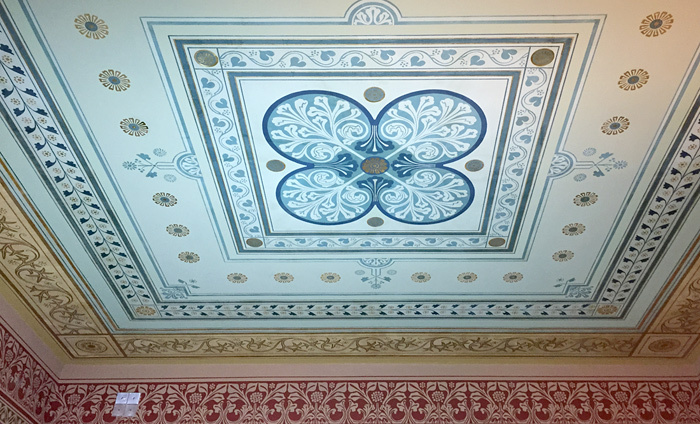 Constructed in lath and plaster, and decorated with its original stencil work and gold leaf, the ceiling had been conserved using thermoplastic resin. In addition to the partial collapse, discolouration had occurred where the resin was present in recent cracks. 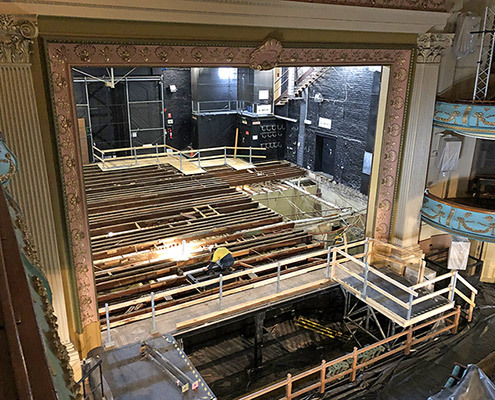 Investigation in the roof space revealed a layer of concrete preventing access to the ceiling cavity — a measure of the highly secure nature of the bank’s construction. This prevented the use of conventional stabilisation systems which are applied from behind. Instead, a grid of steel pins at 300mm centres, screwed to the joists, has been used to support the ceiling. Patch repairs have been made at the pin locations. 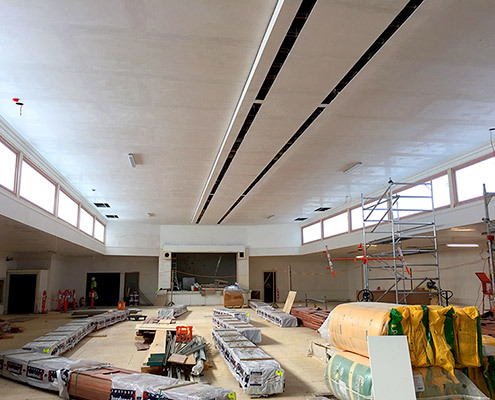 The large areas of collapse have been repaired using new laths and lime putty-based plaster. The decorative scheme has been fully restored, with paintwork retouching confined to the patched and repaired areas. Where resin discolouration had occurred, a separation layer was applied to the plaster substrate before patching, making it possible for repaired areas to be identified in the future.